Lawrence Charles was born April 24, 1942, in Stafford, Kansas, to Elmer and Eva Brinkman. Eva Maude Odom was born in in 1907, possibly in Hawkins or Hancock County, the daughter of Sanford Ellis Odom (1888–1946) and Leona E. Livingston (1883–1945). The Odom family settled in Noeton by 1910. Eva (later Marie) graduated from nurses’ training at Fort Sanders Hospital in Knoxville in 1933. She married Elmer Brinkman, of Kansas, and moved there by 1940. In 1944, Eva married Guy Kreie in Oklahoma and relocated there. She died in Oklahoma in 1958. 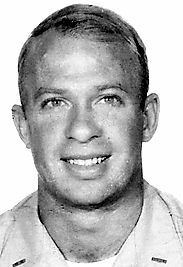 Lawrence Brinkman passed away December 21, 2005, in Bakersfield, California. He is survived by his wife of 33 years, Maria Brinkman; daughter and son-in-law, Georgia and Joe Rickard; daughter and son-in-law, Joanna and Chris Byrd; daughter and son-in-law, Jan and Jay Herrmann; daughter and son-in-law, Jenna and Justin Hardin; daughter and son-in-law, Julie and Kynan Chambers; son, John Brinkman; grandchildren, Christopher, Michael, Nicole, Kevin, Alex, Lauren, Malachi, Summer, Trey and Max. Larry joined the United State Marine Corps in 1960, and the decision to do so went on to pave the path he would follow for the rest of his life. In Vietnam, Larry rose to the rank of Platoon Sergeant in Hotel Company, 2nd Battalion, 9th Marines. He led his men through some of the most intense battles in the Demilitarized Zone in 1966 and 67 against NVA ambushes and the daily sound of artillery. When asked if he was afraid of dying, his reply was No, because I am a Christian. Larry’s military career continued to flourish after Vietnam. He joined the Officer Candidate School for Military Police and Corrections. Larry went on to run several different military correctional facilities across the United States and abroad. When Larry retired in 1987, he had advanced to the rank of Lieutenant Colonel with the Legion of Merit, two Meritorious Service Awards, two Navy Achievement Awards, served as Chairman of the ACA Military Corrections Committee and was awarded the Austin MacCormick Award by the ACA Military Committee. He also received his Bachelor of Arts in Criminal Justice Administration from Park College, Missouri and graduated from the prestigious FBI Academy in Quantico, Virginia. As a civilian, Larry continued to serve the public as a warden at numerous state and private correctional facilities across the United States and in Australia. He was also appointed Inspector General for the Department of Public Safety for the state of Hawaii from 1990-1992. In 2001, Larry was given international recognition for his work and dedication when he received the Warden of the Year award before retiring in 2003. In addition to his successful career as a Marine and Warden, Larry was a family man with a strong sense of tradition and raised his family in the faith of God. He remained passionate throughout life about his health, earning several body-building titles, including “Mr. San Diego” and “Armed Forces Master Champion.” In addition, he was featured in FLEX magazine and made an appearance with Clint Eastwood in Heartbreak Ridge. An avid car enthusiast, Larry took great pride in making his 89 Turbo Trans Am unbeatable and all his cars spotlessly clean. Larry was a man of great faith, courage, compassion, intelligence, and honor. His personality was so vibrant and warm that his presence, especially his smile, would fill a room the moment he entered. Men and women from many different walks of life and generations consider him a hero, a role model but most importantly a friend. The people who knew him, the country he loved and the world in general are all a little more empty without him. We have all lost a great man and will miss him dearly. Semper Fi.